You are currently browsing the tag archive for the ‘stress management’ tag. Every summer of my childhood, my parents would load us, and our belongings into the car, and we’d head to Kansas to visit our grandparents. It meant two days of driving with the windows rolled down and hot air blowing across our faces. This was long before air conditioned cars and interstate highways. To my sisters and me it was two weeks of pure wonderfulness. Nothing but fun and adventure. We didn’t mind the heat or humidity. In fact, we didn’t even notice. We were too busy having the time of our lives wandering freely around the small town where our grandparents lived, catching fire flies, eating popsicles, going swimming, playing dress-up, making hollyhock dolls, and building tiny worlds from catalogs. We spent hours with the Montgomery Wards and J.C. Penney catalogs that our grandmother saved for us. It was paper dolls on steroids because we could create entire worlds for our doll families, not just change their outfits. We created whole neighborhoods of houses and furnished them with every possible thing our paper-doll-people might ever need. Those catalogs were the most amazing toy ever! Last weekend I stepped into that world-building experience again by making a fairy garden. I’d had the supplies for a long time but hadn’t taken the time to actually make the garden. I was waiting to purchase the “perfect” container, which I kept putting off. It seemed like a frivolous expense when funds weren’t exactly flowing freely. Then I had an awakening. It was one of those embarrassing aha moments when you realize just how off base your thinking has been. 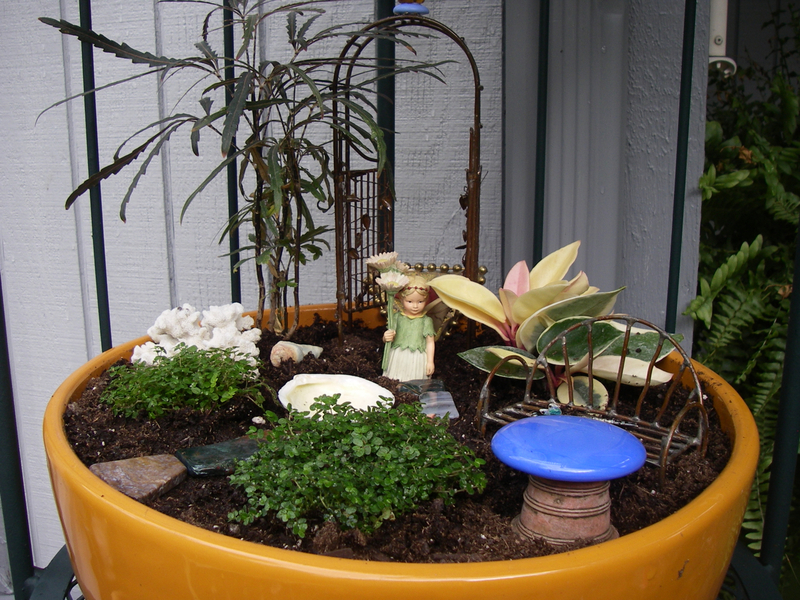 I could build my fairy garden in a container I already have. So on Saturday afternoon, I revisited the fun of playing with dolls. After a quick trip to the nursery for the plants I needed, I gathered my supplies and laid them out on the patio table. Time honestly stood still while I immersed myself in this fairy world. I organized, arranged and decorated. I sorted through my collection of bits and baubles for just the right touches. What would a fairy use as a pond? A seashell of course! And those beautiful polished rocks I’ve kept would make a perfect sidewalk. It was a lovely way to spend a Saturday. I noticed how relaxed I felt. Yes, that long to-do list is still there, waiting for me, but I think I feel more like tackling it now that I’ve given myself a break. It’s a lesson I keep going back to because obviously I haven’t fully learned it. Play is important and adults don’t do nearly enough! What kind of R&R helps you? 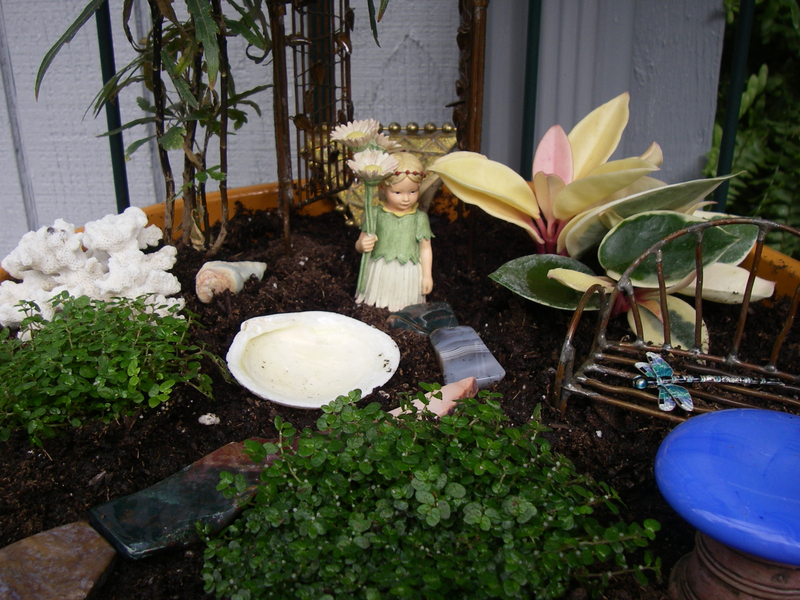 Anybody else built a fairy garden? I highly recommend it. When I left off yesterday, I’d just described my terrible, horrible, no good, very bad day. And my husband’s. Now it looked as if Bud was going to join us. If you want a quick recap, here’s yesterday’s story. The closer Bud got to the gate and Beau, the jumpier he became. Rick was having a hard time holding him steady. I opened the gate, making a clear path for Bud to run through, while Rick encouraged Beau to back off. Bud saw the opening and went for it. He blasted toward me, panic written all over his face. In other words, he wasn’t paying attention to anything except getting away from Beau. He didn’t notice the string of tape that had been used to divide the pasture before the herd broke through. He ran through the tape, getting his feet caught in it. And somehow, still totally unknown to me, he drug the tape with him toward the car and Pepper. Past me at the gate. It totally freaked him out. Miss P. wasn’t too happy either. And somehow, in mere nano seconds, the tape wrapped around my ankles and pulled skin off. In hindsight, I think I was lucky it didn’t knock me to the ground. I freed myself and went to calm Bud and Pepper. 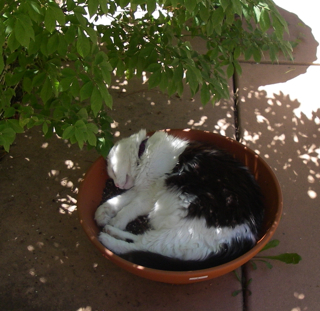 A pan of grain went a long way to helping Bud relax. When Pepper finished eating, I took her back into the pasture by way of a different gate. I wanted to draw Beau away from the bachelors. Thank goodness, that may be the only part of the evening that actually worked. With the love triangle out of the way, we thought things were on the upswing. When we led Bud back into the pasture, Amigo pushed his way out. He’s never done that before. I swear he was picking up on the wonky energy. We got him back in, handed out a few snacks and decided we’d better head for home. Summary of the evening: A total cluster F***. Lesson learned:Horses are Zen masters when it comes to sensing energy. And pretty darned good mirrors. They reflected back every ounce of the chaotic, negative energy we brought into the pasture that night. It was such an in-your-face lesson about managing stress. 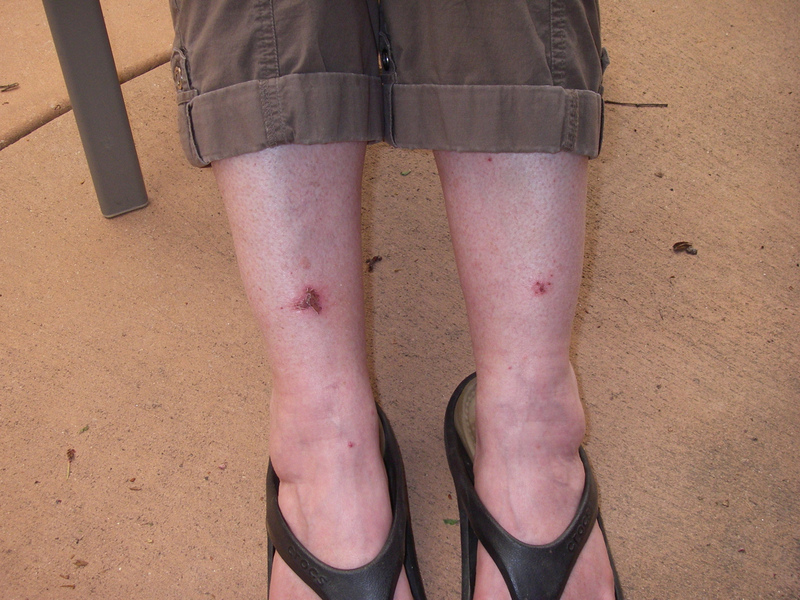 And in case I didn’t get the lesson right away, I have two scabs on my shins to remind me. Here’s my question to you: Have you had an experience where your animals reflected your bad mood? Tell me please so I won’t feel like the Lone Ranger. 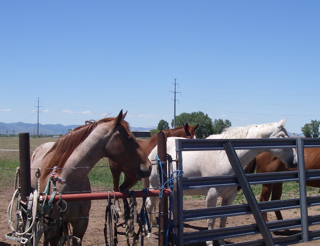 I’ve written about the meditative aspects of my time with the horses on several other occasions. Here are a few examples if you’d like to wander down memory lane. This past Saturday I had a lovely grace moment in the pasture. So This is Why They Call it Work! It has been a rough few weeks (months?) for me in terms of a work project. I’ve felt like a gerbil running on a wheel. I run and run and run, but at the end of each day, I can’t see any progress, except my exhaustion. Apparently they’ve named it work for a reason! So late in the day on Friday, I had a breakthrough of sorts. At least I could see a small shift. I began to breathe a bit easier. I slept all night for the first time in a long while. I felt infinitely more relaxed. Then Saturday was a glorious day. The wind of the past two days had died down. The sun and fifty degree temperatures warmed the horses and me. The pasture glowed in a golden, sunny light. I spent longer than usual hanging out with my horse friends. I brushed Bud and Pepper as they ate. I handed out numerous alfalfa cubes to the herd of oldsters. I talked to them and they listened. Horses are excellent listeners. I could be kidding myself, but I think they are especially fond of the oldies rock and roll songs. It was a mellow afternoon, and the stress just oozed out of my body. When I finally packed up the horse gear and drove off, I had to stop the car to close one of the gates. I saw a horse and rider in the adjoining pasture and I waved, though I wasn’t sure who it was. As they came closer, I saw that is was Old Joe, the other spotted horse in the herd. We’d named him Griz when we first met him, before we knew his real name. He sometimes hangs out with the oldsters. “I think he wants to see you,” the man said. Indeed, Joe was making his way toward me to say hello. So I stroked his neck and asked him how life was going for him. I also talked to the man who sat atop Joe. “He likes you,” the man said. “I like him too,” I answered. After a few minutes of chitchat and horse petting, I drove off, and Joe and his rider went on their way. I was so touched that Joe recognized me and came to say hello. It was just the sweetest moment. Thanks Guys! You’ve enriched my life in ways I never could have imagined. I don’t know if you’re feeling the crush of projects to complete, commitments to honor, people to please, and in general, just a whole lot to do. A huge work-related project has fallen into my lap with an early deadline and I feel buried. Exhausted before I even begin. For me, that often means I need a good old-fashioned dose of nature. So I sorted through my photos to find one of my favorite photographs. 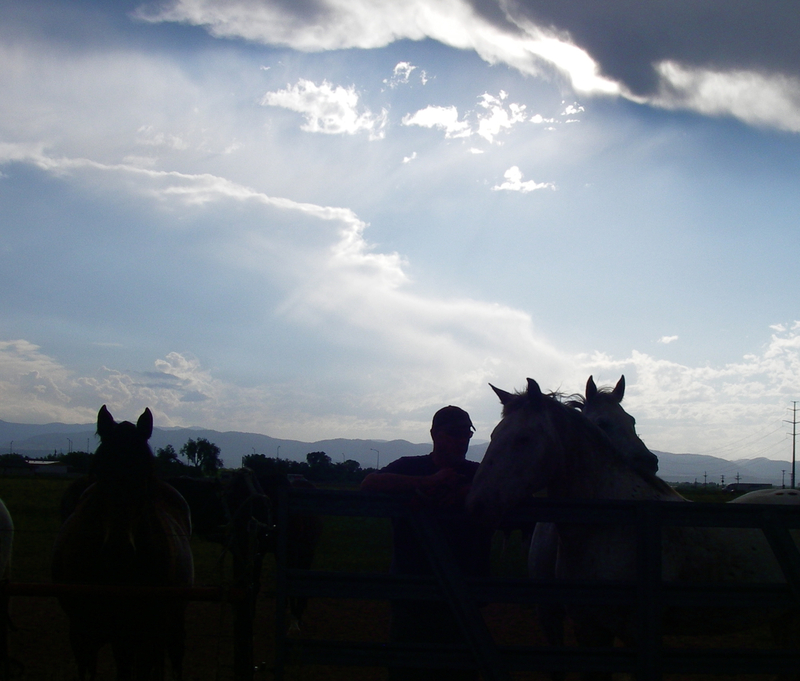 This picture of the late afternoon sky at the pasture always makes me feel better. When I look at it, I remember to breathe deeply. I sink into the clouds and the memory of the day when I pulled out my camera to get the shot. And I remember who I am and that I can get through anything by breaking it down into manageable steps. If that sounds like a lot to get from one photograph, it may be. But somehow in the great mystery of life, it does just that for me. And I offer it to you in hopes that it will do the same for you. P.S. Send a good vibe or two my way if you’re so inclined. I can use all the help I can find. Thanks! I needed to get out of town last weekend in the worst way. I’ve been stuck at the computer for hours on end, working and worrying. It’s not a good combination. I was on electronic overload, my eyes glazed over from staring at the illuminated screen. And my brain felt like it had a short circuit. Bzzt, bzzt, bzzt was the most it could produce. I needed a nature fix. Most of the time, going to the pasture with the horses will do it for me. Working in my garden or going for a walk usually helps get me back in balance. I had to pull out the big guns, the super antibiotics for the soul. I needed a double dose of Mother Nature. I wanted to feel wild and free. And especially, I wanted to be unplugged. A few weeks ago I wrote about going to Vedauwoo, in Wyoming between Cheyenne and Laramie, and how it’s one of my heart places. 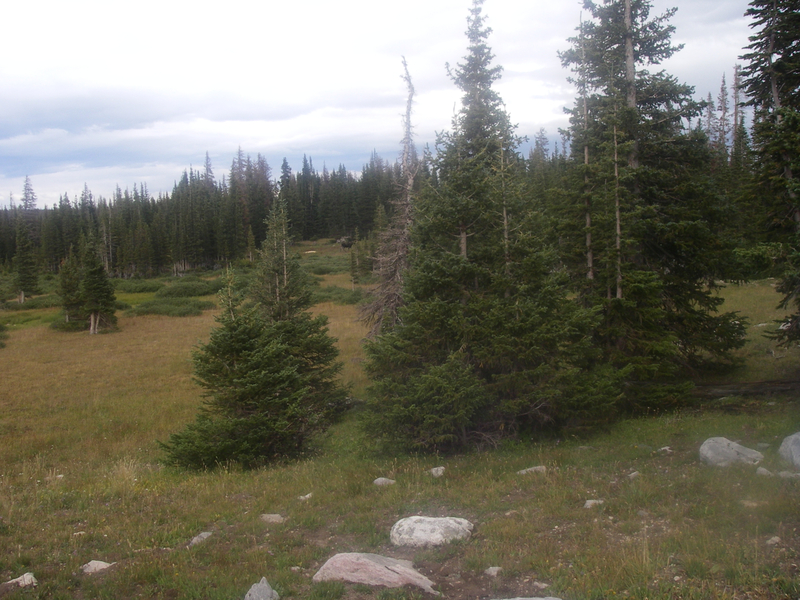 Another of those is the Snowy Range, west of Laramie. As far as I’m concerned, this is a magical place. I’ve gone to Snowy Range nearly every summer since I was a little girl. Years ago I learned to downhill ski there. I’ve camped and hiked and picnicked. I’ve roasted marshmallows and hot dogs over a blazing campfire. I’ve huddled in a tent waiting out the rain. I’ve chilled watermelon in a snow bank. I’ve catalogued wildflowers and spent hours watching marmots at play. I’ve dipped my tired feet into icy streams. I’ve felt that good kind of exhaustion from physically pushing myself beyond anything I thought I could ever do. So when I was in need of a dose of nature, Rick and I decided it had to be Snowy Range. We only had one day, not enough time by a long shot, but we made the best of the time we did have. There is something about the wide-open spaces of Wyoming that immediately soothes me. Yes, it’s home and hardwired into my psyche. But also, I think it’s the uncluttered prairie that helps my overly cluttered brain relax. Not even fifteen minutes out of town, I started to breathe easier. The day was cloudy and overcast. I got lost watching the sky and the many shades of gray in the clouds. It was stunning really, so many variations of color. 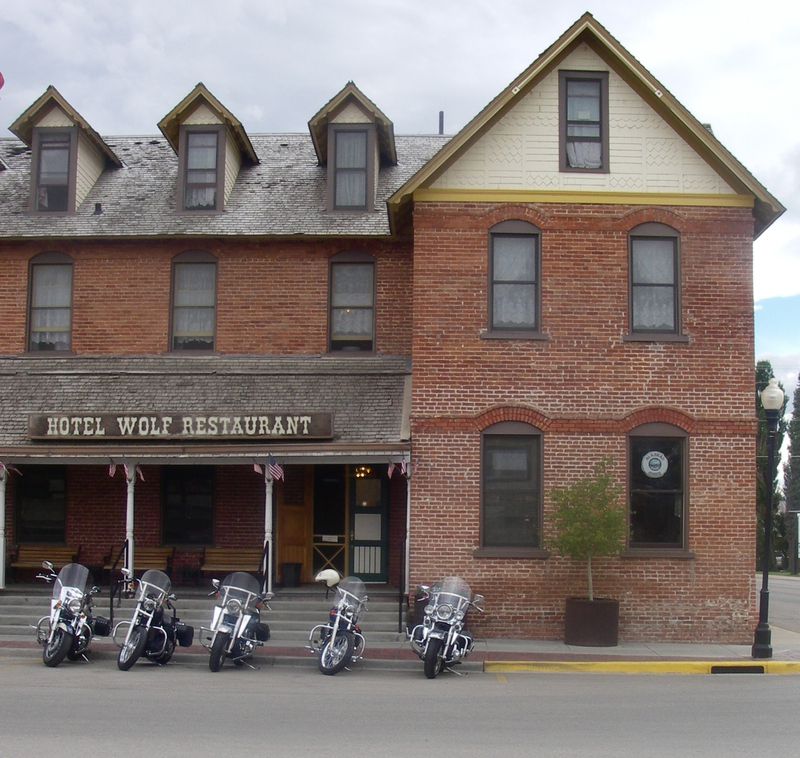 We drove through Laramie and headed west toward the little town of Centennial. All the while, my brain continued to un-kink, unwind and relax. We didn’t talk much. I didn’t even want music. I just drank in the landscape that I’ve loved for so much of my life. We had no plan, no agenda, and that suited me just fine. On a lark, we decided to drive on to Saratoga for a late lunch. In Saratoga, our noses led us to an amazing restaurant – Tommy’s Smokehouse BBQ. As Rachel Ray would say – delish! It was really a “find” – the Pants on Fire sauce was fabulous, the pulled pork tender and smoked to perfection. The Kaiser roll was soft and tasty. Yum to all of it. And the best part? I felt better. Much better. Good food, a healthy dose of Mother Nature, and time with my husband were doing their magic. P.S Tomorrow, more about Snowy Range and the moose. Stay tuned! While we can’t imagine your cardiologist actually saying these words, he or she could. There’s some very interesting research, first reported a couple of years ago, that Mija wants you to know about. In a ten-year study of over 4000 people at the University of Minnesota, researchers found that owning a cat reduced risk of dying from a heart attack or stroke by a whopping 30%. If anything, it’s more like cats own you. She hasn’t checked this out with the researchers, but she’s pretty sure they’d approve. I mean really. Owning a cat. How barbaric! It’s all in the purr baby. It’s been speculated that cats have an edge over dogs when it comes to health benefits because they provide extra relief from stress by sitting on your lap and purring. And providing the opportunity for continuous petting. Your stress melts away and your cat gets a long, lovely massage. Mija is really not one to badmouth other species. She knows there’s room for everyone on this planet. But she’s gloating a little over the results of this study. So spend time today with your cat. Your heart will thank you. And, if you don’t have a cat, pet your dog. It’s all good. It’s Wednesday and that means another potcast from Mija. 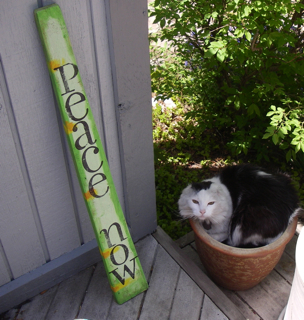 You may notice that she is sending her message to you from a different pot this week. 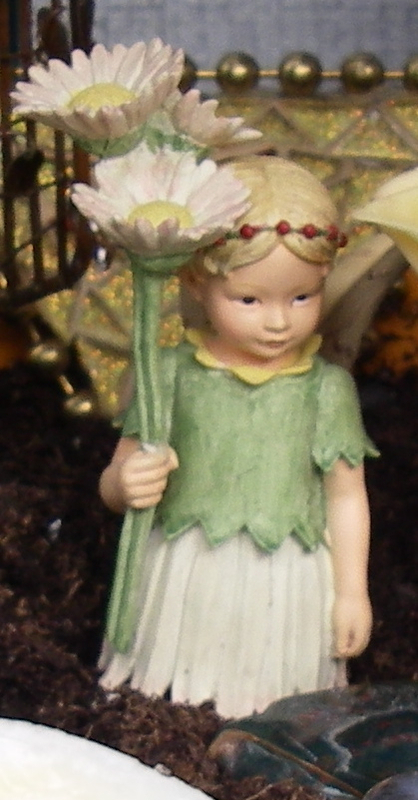 In fact, she has three pots in different locations in the yard that she rotates between. In the heat of summer, she favors lying in the shade. And a bed of potting soil that has been slightly dampened makes excellent air conditioning. Mija is a big fan of gardens. She spends some part every spring, summer and fall day enjoying her outdoor domain. It’s why I have to work from home! Mija can be cranky when she misses out on her daily sojourn in the garden. And really, it’s a small thing to give her time with the flowers. She approaches the garden as if she were the duchess of an English manor house. She doesn’t work in the garden, mind you. 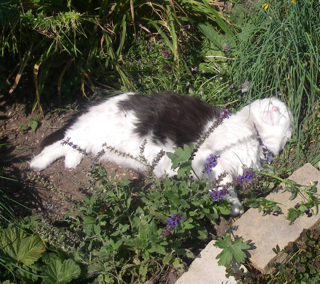 What Mija does is enjoy the garden. If I weren’t so busy weeding, watering and deadheading, I’d have more time to lounge in the garden too. One of my favorite things to do in the whole world is gently stroke my hand along a horse’s nose. The tactile sensation is simply thrilling. And the texture of fine velvet. 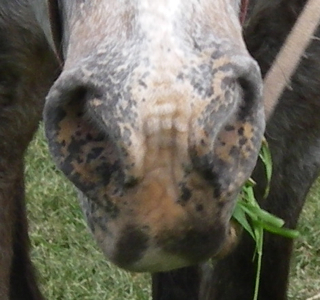 My horses are quite accommodating of my occasional (like every time I see them) need to touch their noses. They know me and therefore allow this intimate gesture. In fact, I think they like it. Of course, they like it best when they also get a treat. I talk to each one in accolades as to his or her qualities of beauty, handsomeness, and overall wonderfulness. Sometimes I sing, which they also quite like. 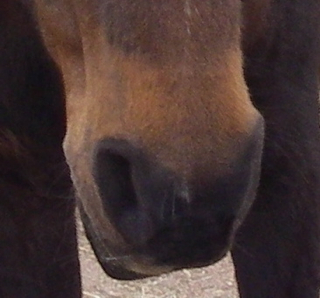 And then I pet their noses, or under their jaw which is another of my favorite spots. Last, I pop a bite of horse candy into their mouths. I’m telling you, this works as well or better than medication to ease stress. There is research about how petting animals lowers blood pressure and reduces tension. 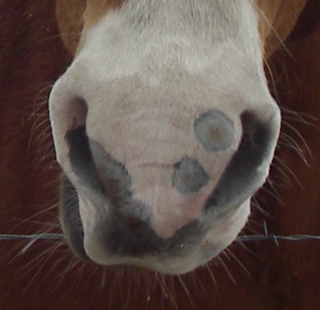 I haven’t exactly seen the work related to petting horse noses, but I’ll bet someone has studied it. And I guarantee you that it makes me feel better. I was having one of those down days – tired, worried and on the verge of tears. Sometimes life just hands a person more than she thinks she can possibly handle. I was there. I loaded up the grain and headed for the pasture because I had to. My enthusiasm was lagging. I was doing it by rote. Little did I know that Mother Nature had a surprise in store for me. A little vitamin for my soul on a day when I needed a super giant-size bottle of vitamins. I pulled down the road toward the gate where my crew usually hangs out – at least at lunchtime. Instead of our little herd of oldsters, I saw the entire herd jammed close to the gate. Bud, Pepper and friends were a few yards away, more toward the middle of the pasture. I knew Pepper and Bud wouldn’t come through the other herd. They’re sworn enemies. 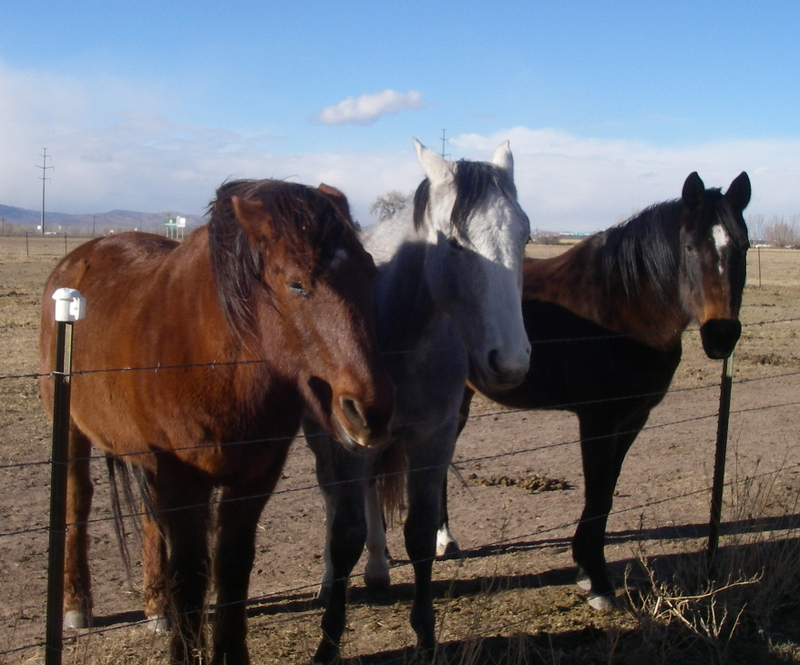 I pulled out a lead rope and began to swing it at the horses by the gate, hoping to encourage them to move away, so that Bud and Pepper could find a hole and get to their food. 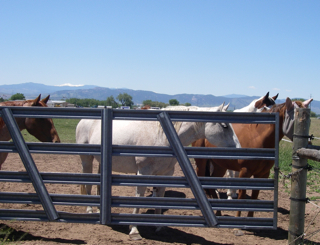 That’s when I noticed that the horses at the gate were gazing, almost transfixed, on the adjacent pasture. I followed their gaze and saw what was so fascinating. 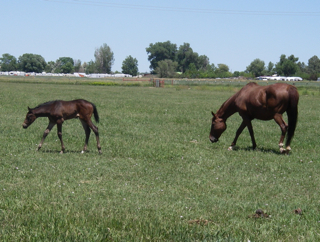 The foal and his mother were out getting a little sun. He is the cutest little guy. He’s gangly and still a bit wobbly on his legs. He was having a great time gamboling (I’ve never been able to use that word in a sentence before!) 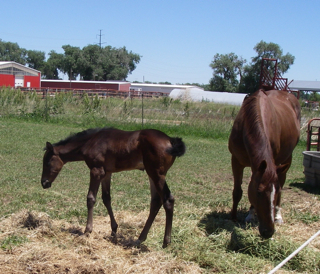 around the pasture, picking at grass and hay, but mostly nudging his mother to let him nurse. I felt my sadness shift a bit. Babies do that to me. Doesn’t matter if it’s a human baby or a horse. I even get mushy over baby mice. I opened the gate and twirled the rope overhead. It makes a kind of whirring sound that gets the horses’ attention. They moved just a little, but enough that I thought Bud and Pepper could get through. They were watching this whole adventure of mine. Slowly they approached, and then, like a flock of birds in flight, they turned away in unison. Bud, Pepper, Amigo, Red, Baby, Macie and Hanger headed away from me. “You can do it,” I coaxed. “Come on.” I kept talking to them, and all the while I was swinging the rope to keep the rest of the herd away. It seemed like they were mustering their courage. And then, it was sweet old Pepper who made the break. She laid her ears back, put her head down and ran for all she was worth toward me and the gate. With her arthritic legs, this was a big deal. Bud followed close behind. They ran past the “mean horses” through the gate to their food. The mares from the other herd worked their way back to the corner of the gate and resumed their vigil over the foal. They watched him with rapt fascination until he finally laid down in the grass for a nap. Only then did they move away. It was a beautiful sunny day. 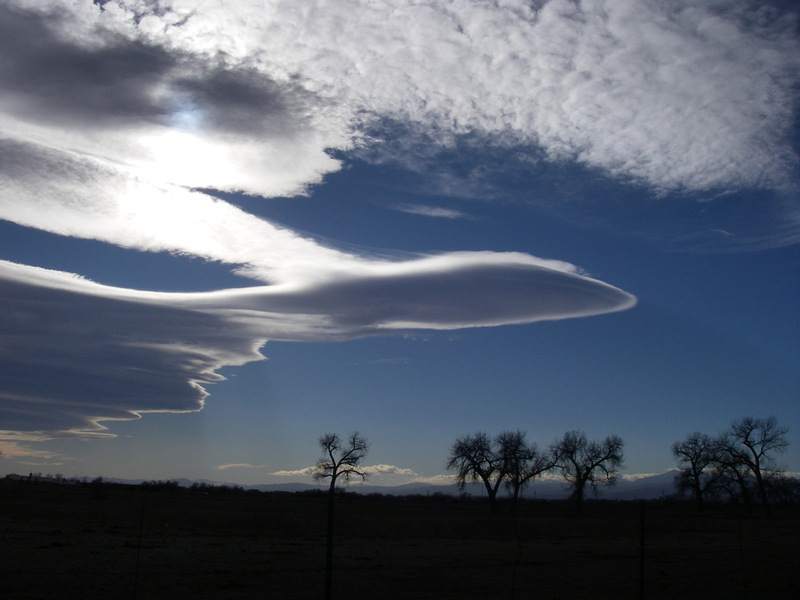 The sky had puffy clouds, so perfectly shaped they looked more like a child’s drawing than reality. I brushed both horses, took pictures of the foal, handed out treats, and allowed myself to relax, just a little. I soaked in the simplicity of being with my animals, sun on my face, breeze ruffling my hair. I felt better. 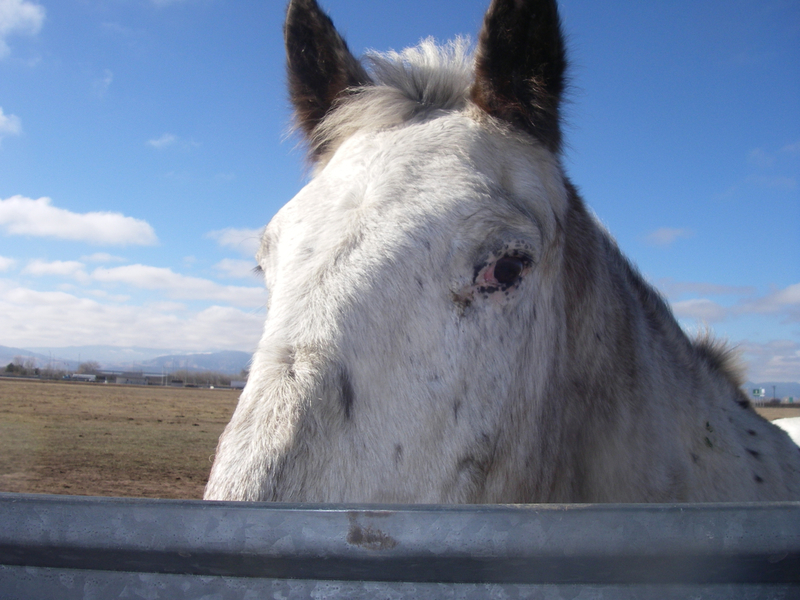 I was softer, as if being with the horses had once again smoothed off some of the rough edges of my day, my week. For the hour or so that I was in the pasture, my stress was gone. I am incredibly grateful that I have these gentle yet powerful healers in my life. Now if only I can transfer this feeling to the other twenty-three hours of my day, I’ll be in great shape. I finally had to yield to the urgings of “her diva-ship” and give her a day to offer her thoughts to the world. We’re calling her weekly posts potcasting because sitting in a pot on the patio is one of Mija’s favorite summer activities. Besides, she loves all things technological and is a regular little propellerhead. Well maybe not so much. But we both got a chuckle about the play on words. Mija will be potcasting about how humans can squeeze every possible bit of enjoyment out of life, from her perspective of watching us for her entire life of 15 cat years. She’s a keen observer of people and knows quite a lot. For her first message she wants you to pay particular attention to her lovely sign, “Peace Now.” It’s the work of northern Colorado artist Lisa Hoffman, in case you want to get one for your own patio, and be reminded to slow down and find some peace in yourself. This morning I was working at the computer in my home office. I was concentrating as I clacked away at the keys. I was on a roll. At least I thought so. Then I heard a rising crescendo of meowing coming from the doorway. Mija stared at me and meowed until I pushed away from the desk, walked to her and picked her up. Mija’s takeaway message for you: If you have to sit at that awful machine and not pay attention to your animals and/or family, at least schedule frequent breaks. Preferably with a cat. A dog will do in a pinch. A baby works if you have no animal options. It would be a shame to let summer pass you by, just because you thought you had to get something done. Stop and sniff the catnip baby.